This Critical Thinking Brain Teaser will test your brain. This brain teaser will look quite odd to you in your first reading. This is lateral thinking brain teaser which can be solved if you think about it from all possible angles. This Brain Teaser will make your think out of box. Let's see if you can answer this critical thinking brain teaser! 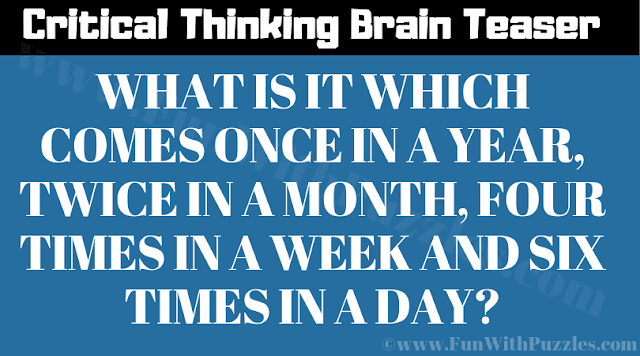 Answer of this "Critical Thinking Brain Teaser to test your Brain", can be viewed by clicking on answer button. Please do give your best try before looking at the answer. Four times in a week: 7 days in a week, and if you were to label the days of the week by number, then there would be 4 odd days. 6 times in a day: Consider daytime to be 12 hours, and half or 6 of the hours of the day would be odd 1, 3, 5, 7, 9, 11 i.e. six numbers.